Achieving the best wireless network coverage for your weather devices, home automation or office using only a single wireless router is quite a challenging. On one hand we have a saturation of frequencies used by countless wireless devices, and on the other – challenges that we have to overcome when we are positioning, installing and setting our new wireless router, home weather station or internet of things (IoT) sensors. Most often determining the position of the WiFi router, or any of the mentioned devices, does not take into account the optimal position for maximum coverage of available space, but instead is influenced by factors such as the position of the home PC or the location of our ISP’s network cable, and many more. This requires use of alternative solutions to improve the range of the wireless network, such as the WiFi range extender devices. This table compares the RE210 AC750 to other such device from the same product class. For our detailed review please scroll down. Today we are going to review one such device – the TP-LINK RE210 AC750 dual-band wireless signal amplifier. In practice, this type of device represented something like a full wireless router with limited functionality that targets a specific task. In this regard, the majority of wireless routers have the ability to be used as devices for extending the network, although that is not always the case. But when such a function is available most often it is not easy and intuitive and requires the user to know what and how to configure. That is one of the main advantages of the devices such as the WiFi range booster – easy to use and setup, even by novice users, or at least that should be the case. TP-LINK RE210 is not the first WiFi Range booster by TP-Link. Before that the company offered several variations of 150 Mbps and 300 Mbps 2.4-GHz solutions and the dual-bander – RE200. The current RE210 has a completely new design, which is certainly a major step compared to previous solutions regarding functionality and user convenience. We are talking about the presence of two antennas whose position can be adjusted by the user (previously antennas were built in and fixed), and couple of convenient buttons for device control – on / off, reset and one for stopping the LED indication. 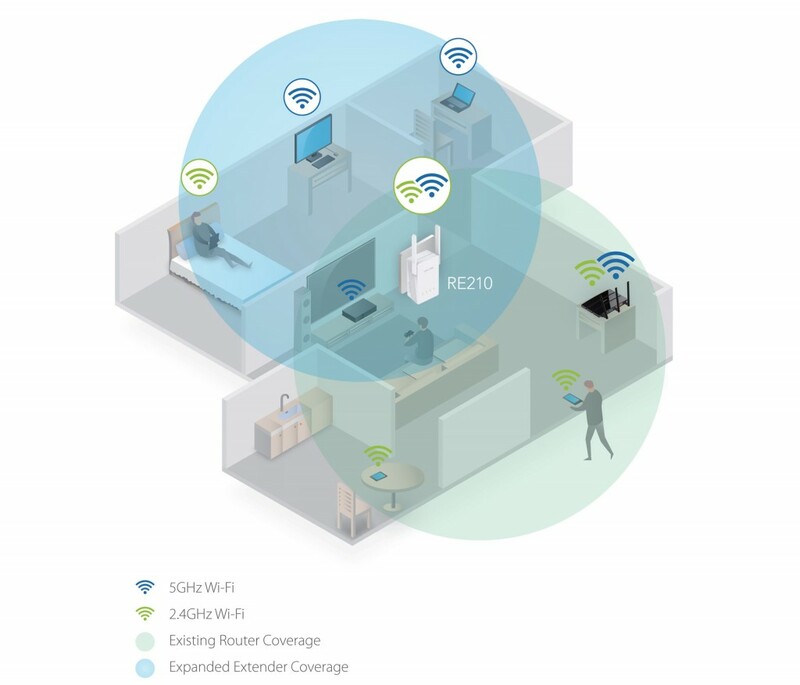 The device for expanding the range of the wireless network is a dual-band – works both 2.4 and 5 gigahertz, has compatibility with all current wireless standards 802.11 a / b / g / n / ac and comes with a Gigabit Ethernet port for connecting a device without wireless functionality. 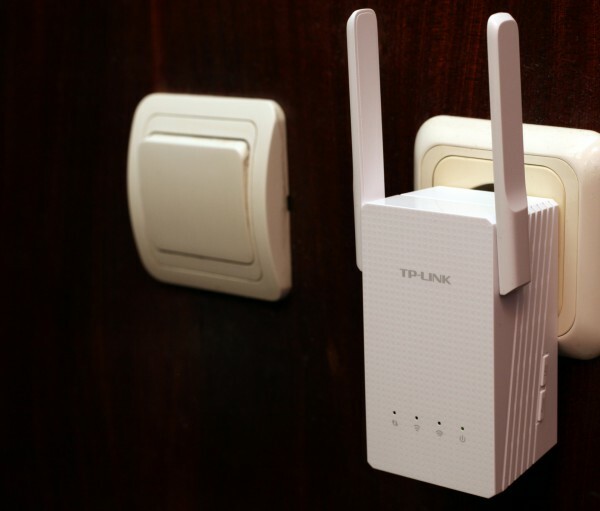 The design is intended for direct connection into a wall socket, as in the previous models of TP-LINK, but with RE210 due to external antennas is not a problem to position it anywhere and adjust the correct position of the antennas for optimal range. The idea of all the wireless network extenders is to be positioned so that they are close enough to the WiFi router to be able to get all the benefits of the broadband connection. At the same time they need to extend the wireless network, and depending on how good the coverage must be, the situation may require the use of several WiFi Range Extender devices for optimal effect. 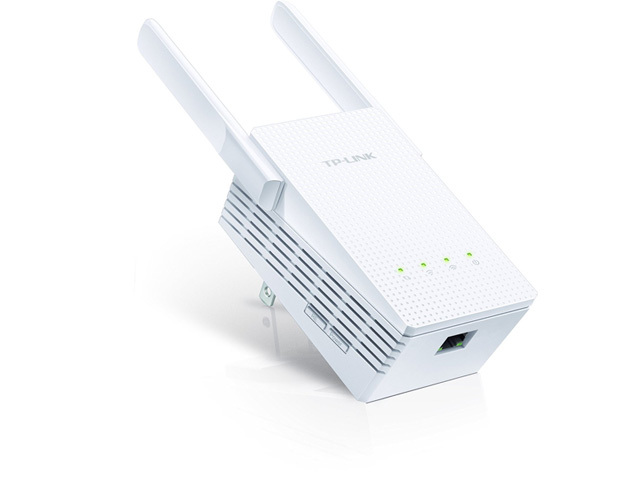 TP-LINK RE210 offers two connection modes – automated – that uses WPS (it is necessary the WiFi router to has this option), and manual – that uses a standard web-based interface. Using WiFi Protected Setup (WPS) to connect between the Range Extender-and the wireless router in theory should be fast and easy, no matter what brand and model you are using. 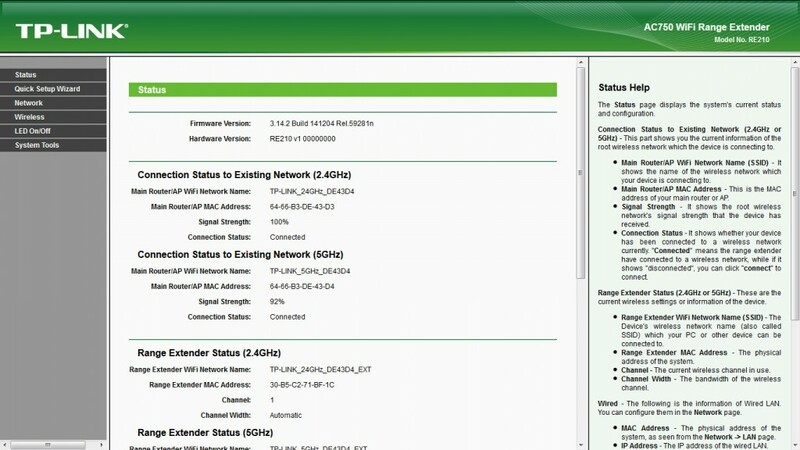 During our tests with dual-band TP-LINK router (similar to this one) using WPS to automatically connect we encountered small difficulties, namely the automatic configuration is performed only for 2.4 GHz or 5 GHz band, but not both. So not always the easiest way turns out to be the smoothest one. Fortunately the good old manual method of adjustment through web interface did not have any problems. TP-LINK RE210 offers a convenient visual indication of his status when connected via WPS (RE button on the Range Extender), and has a light indication to pint the strength of connection between him and the WiFi router, and all of this is used for convenient optimal positioning. Information about the strength signal is also available in the web interface of TP-LINK RE210, so that you can easily find the optimal position for quick access and maximum extension of the wireless network. The built-in Quick Setup Wizard for configuring via a Web interface provides a super fast and easy set up even novice users. Just select the wireless network whose scope you want to improve, connect to it using the configuration access, and can choose whether to use the same name as the wireless network or you want the extender to another SSID (network name). When using the same network name for the extender and the WiFi router, users of the wireless network should automatically switch to the signal with the greater strength. This is especially convenient for use on mobile devices such as smartphones or tablets. When using different name for the extender is easy to ensure that you are connected to WiFi router or extender and to avoid the possibility of jumping from one device to another and vice versa. TP-LINK RE210 has a wide range of setup options for its wireless functionality. We want to put a little attention on one interesting operation feature that the extender has. We are talking about two modes of operation, between which the user can switch – range expansion for both of frequencies and High Speed mode for optimal speed. With the High Speed mode you are actually using one wireless frequency to connect users to the extender and the other for WiFi router connection. This is a mode which can achieve a better work efficiency. Especially if the user is connected to the extender in the same room at 5 GHz, and the connection to the WiFi router in the adjacent room is done in 2.4 GHz. The downside here is that there is a chance you have to use an older device that has no support for 5 GHz wireless frequency. Let’s start the test at 5 GHz with WiFi our router located at one end of a large office with several rooms. As expected due to weaker-power of the 5 GHz signal, coverage of more than half of the office space over a WiFi is very weak, even to mobile computer with Intel Centrino Ultimate-N 6300 AGN wireless adapter with 3 antennas. Adding the amplifier improves the situation, especially the left side, but we will need at least one more extender for optimal results or even two for maximum coverage and high-speed connection. Here is the coverage with the same WiFi router, but at 2.4 GHz. The situation is better than that at 5 GHz, but again in the opposite corner coverage is far from good. On the second picture you can see the coverage provided by the TP-LINK RE210 AC750 WiFi Range Extender. Certainly even deliberately wrong positioning of the WiFi router, after the inclusion of amplifier situation is significantly better. And although even with one device the situation quite good, the addition of another one would lead to a perfect coverage of the entire area. Of course improving the positioning of the main router in combination with the range extender can really achieve excellent coverage of large areas. However, as we already mentioned very often positioning of the primary WiFi router is far from optimal and moving him is not an option, or at least not easily achievable, so the use of the WiFi range amplifier can help improve things. Sometimes only one extender can be sufficient but not always. A lot depends on the area of operation and the obstacles the signal must overcome. Using devices such as TP-LINK RE210 can be the best way to increase the range of your home or office network. The extension can become quite easy and can be performed by non-specialists, something that is often a problem if you decide to use a standard wireless router for the same purpose. Anyway TP-LINK RE210 AC750 WiFi Range Extender provides a fairly good option for expanding the range of your wireless network in a comfortable, compact and functional manner. The device is especially suitable for ordinary users, and not network management gurus. One of the reasons I have purchased this TP-Link RE210 is because I have a 3G 2.4Ghz in a village in Thailand, and the signal is not constant. It took me 5 hours te make it working. However if I connect my extender in another room I have to figure out how to get Wi-Fi in that room again. Furthermore I have read the manual (downloaded from Internet) 3 times, and it is quite difficult to find out how to set the best parameters for the extender. Is there someone who has 3G, and can share their experiences with me? I’m mildly satisfied about this extender, but I think it will be much better with the right settings.